Choose your pure inverter by wattage ranging from 1000 to 3000 either Professional Grade or Pro Series Professional Grade Kits. Pre-assembled Inverter kits for a quick, easy and safe installation of the high power Thor inverters and require no special tools. No more searching for fuses, lugs, and cable as they will arrive all in one convenient package. Thor Inverter Install Kits will reduce unnecessary inventory, vendors and more importantly they remove the guesswork so that you can install your inverter and be up and running quickly! No hassle to find what you need for your inverter. Save time and money, receive everything in one box. Looking for an easy, quick, and safe installation of inverter? Grab this all in one package of Professional Grade Pure Inverter Kits. Highly recommended for all mobile applications to ensure superior safety and efficiency. 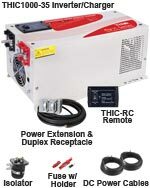 Pre-assembled Inverter kits for quick, easy, and safe installation. 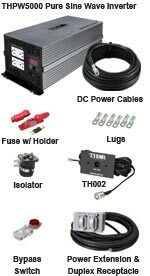 Pre-assembled Thor 1000 Watt Inverter Charger Kit for a quick, easy and safe installation that requires no special tools. For superior performance in an affordable package! 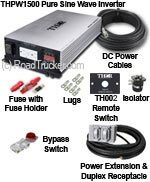 Receive everything in one box with this Professional Grade THIC2000-35 Inverter Charger Kit. Plug & play design. Easy to install with no special tools. Designed to support professionals looking for superior performance in an all in one package. Highly Recommended for All Mobile Applications. 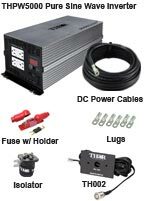 Receive all necessary items at once with a Thor Inverter Install Pro Kit. 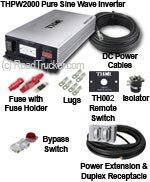 No more guesswork out of installing your Thor power inverter. Save time and money, receive everything in one box! Turn your vehicle alternator into an AC Power Source. 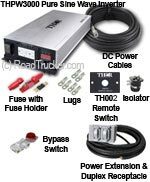 Professional Mobile Power Install Kits for your fleet and service vehicles! All-in-one box! 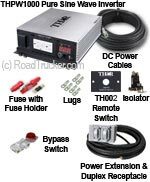 Pre-assembled Thor mobile power install kits give you all of the essential components for a complete and independent AC power system. Choose the desired accessories you would like with your inverter. Designed to support professionals looking for superior performance in an affordable package.